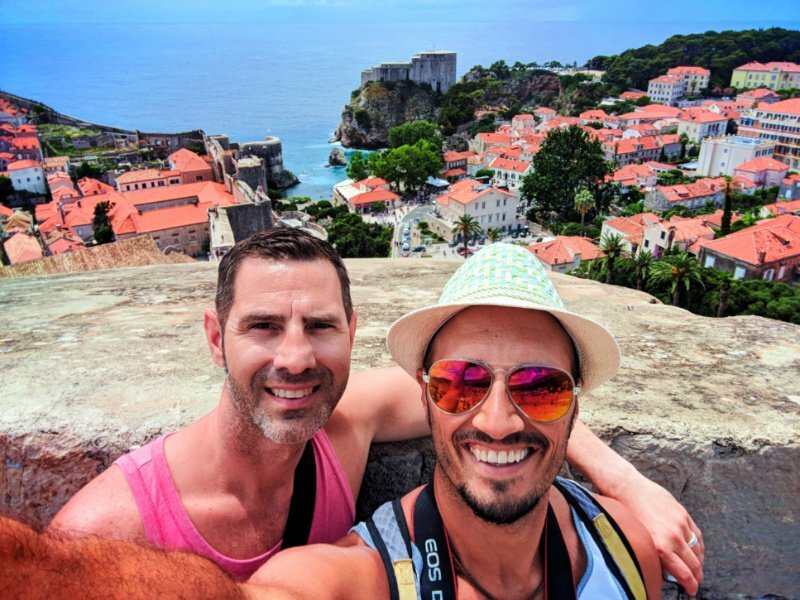 Unless you’ve been island hopping in the Dalmatian Isles, you might not have heard of Mljet or considered visiting this funky little Croatian island. 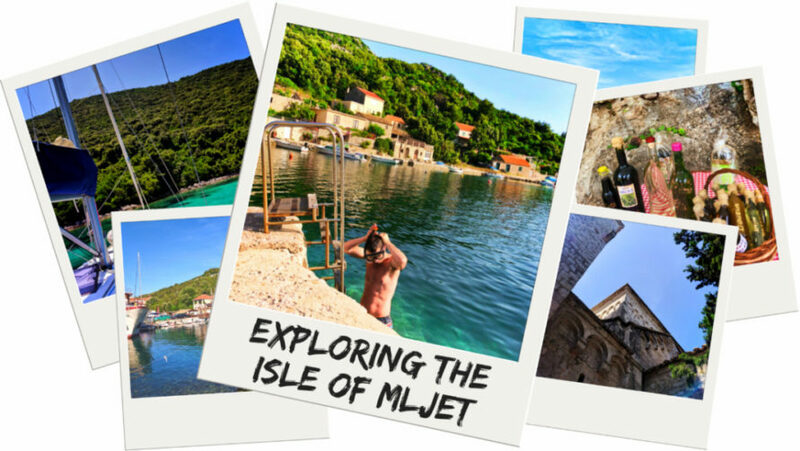 There are lots of things to do on Mljet and if you have the opportunity to spend a few days here, it’s well worth it and you’ll be so glad you did. 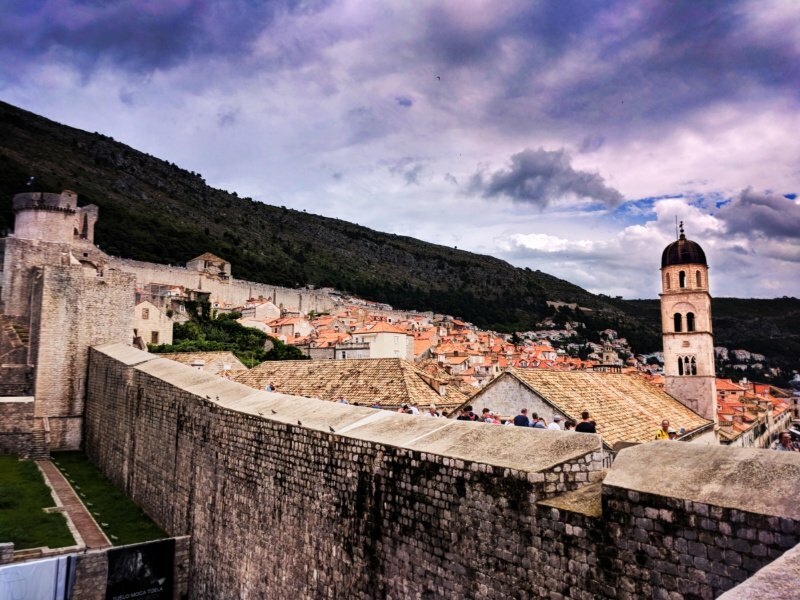 We loved the two ports we visited on the island… and learned a lot about Croatia. 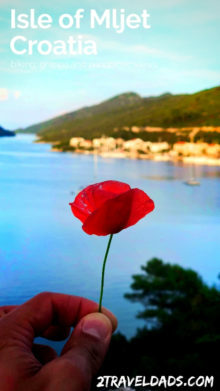 Mljet was an amazing surprise filled with butterflies, vineyards, lamb, and even a pirate monastery. 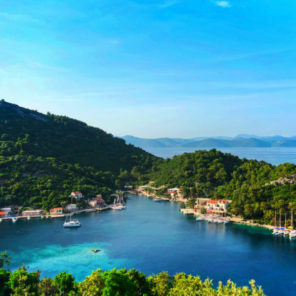 Take a look at what makes Mljet the most fascinating of the Dalmatian Isles. And then please let us know when you’re going to visit because we’d love to go back and spend a few more days there. 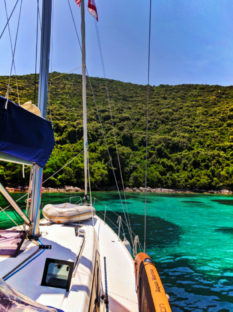 If you’re doing a sailing adventure through the Dalmatian Isles like we did, you’ll be able to visit Mljet quite easily. 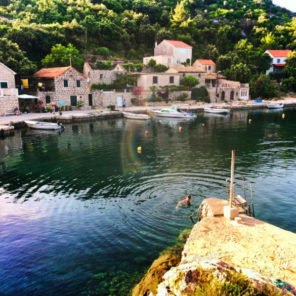 Found between Korcula and Dubrovnik, you’ll no doubt be sailing past. If you’re not actually island hopping (I’m sorry, why aren’t you?) you can take the ferry from Prapratno, which is about an hour and a half north of Dubrovnik. The ferry brings you to the port of Sobra, between our two ports of call, so you’ll be able to explore the whole island from there. When you first arrive in Polače it doesn’t look like much. 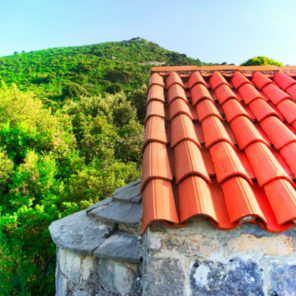 It’s not as medieval as Vis and isn’t as popular as Hvar (because it’s tiny), but it’s rustic. When I say rustic, I mean that it’s only mildly developed, but it’s got enough life and intrigue to be worth visiting. 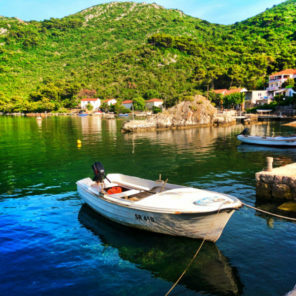 Also, it’s the gateway to Mljet National Park, so you’ll want to be there anyways. There are plenty of things to do in Polače. Directly in the small port town area, there are a few cafes and some walking and hiking trails. If you really just want to stay by the marina, go for it! You’ll have a great time relaxing and enjoying supreme quiet. Also, right next to the town area there are ruins to visit. The ruins around the cove of Polače date from the 1st to the 6th century. You read that right. When you think about Croatia you don’t consider it to be ancient like Greece or parts of Italy. Yep, it’s just as ancient and Polače has the ruins to prove it. 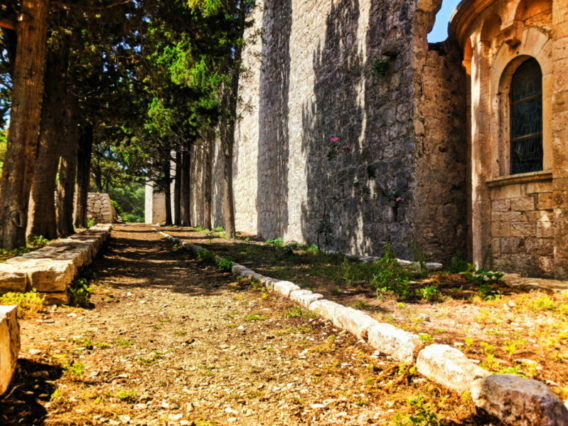 Mljet was a part of the Roman Empire, so just going for a walk is a stroll through history. Literally. 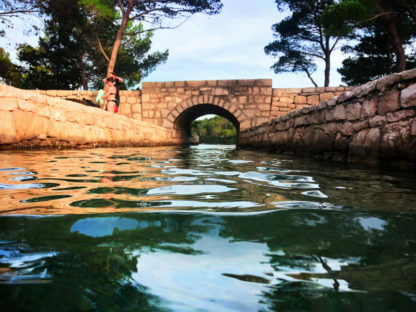 In addition to the ruins, there are some nice swimming spots in the bay/cove of Polače. 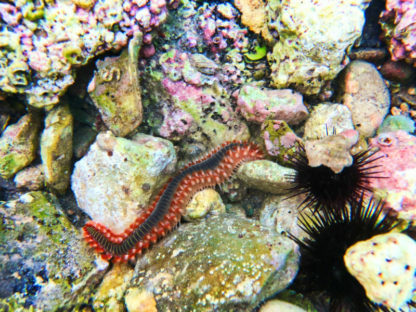 Without even trying, we were wowed by the colorful sea stars, sea cucumbers, urchins and more. Croatia doesn’t disappoint when it comes to random surprise and delight moments, on land or sea. 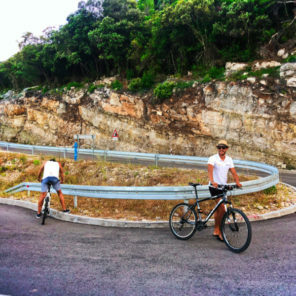 We rented bikes twice in Croatia, once in the port of Vis (awesome biking!) and once in Polače. 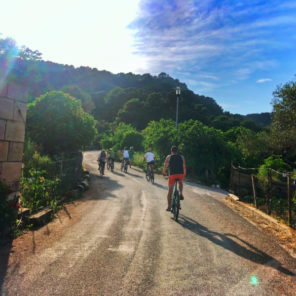 In Polače, our goal was just to be able to ride to Mljet National Park and explore what we could in an afternoon. Renting bikes in Polače was pretty easy, but it was also a bit tricky when it came to pricing. To rent a bike in Croatia, you usually only need cash and a form or collateral. What this means is you need to be able to pay and you have to leave something with the vendor to ensure you’ll bring their bike back. Granted, often a copy of a driver’s license or passport may suffice, but the vendor may ask you to leave the original with them for their own insurance. Note: we left one of our American driver’s licenses with the vendor each time we rented bikes in Croatia. We felt comfortable with this because clearly it’s important to us (value for the vendor) and clearly there’s nothing bad they could do with our licenses in Croatia (comfort for us). Use your best judgement as to what you’re comfortable with, but we felt fine doing the US license exchange. The cost of renting bikes in Croatia may vary from port to port, but the final pricing we got in both of our rental destinations was for two bicycles for 5 hours or less, it cost us about 200 Kuna ($25 USD =/- check exchange rates). We did ask three different bike vendors before settling with our rental lady (who was the sweetest). She gave us the best price because there were five of us and she knew we were good guys. Who knew I’d need to rent a car in Croatia? Never did I think I’d be renting a car called a Bravo, but I did and BRAVO!! 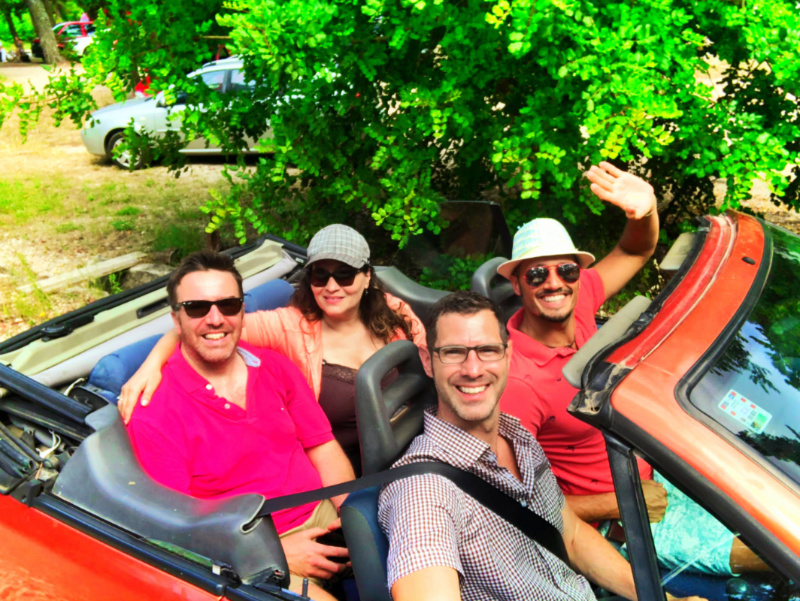 We had a great time driving around the island of Mljet. There is one place to rent a car in Polače, so if you are hoping to shop around for prices, nope. We were able to score a small, not too bad of shape, convertible for less than 5 hours for about $70 USD. 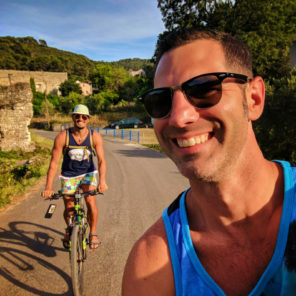 We felt this was worth it to be able to do a little exploring on our own and to get into Mljet National Park faster than hiking or biking. There were a variety of insurance options when renting the car. Just like renting a car in Mexico or the USA, you can choose your level of purchased coverage. 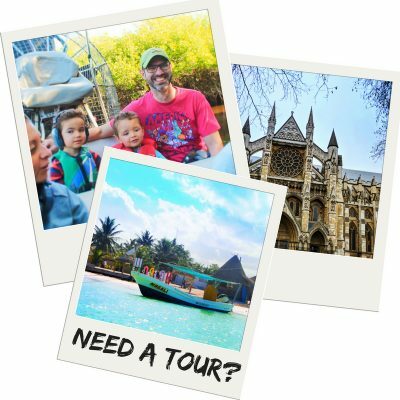 If you are already familiar with how your insurance or credit card will cover an international car rental, go with the least expensive option required. If you are complete unsure or are a worrier, opt for the best coverage. 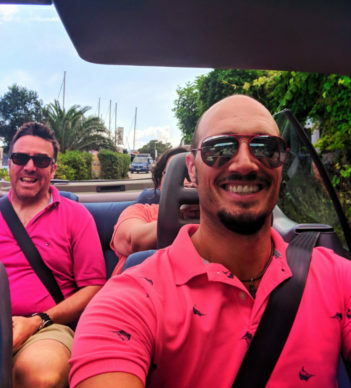 The roads on Mljet, and many places around Croatia, are narrow and winding, so you’ll need to drive very safely, and you’ll want to be insured both to your comfort level and legal requirement. Iced Coffee ISN’T even remotely like American iced coffee. It’s powdered Nescafe granules mixed with loads of sugar and milk… and a few ice cubes. Espresso or “coffee” is just that: espresso. It comes double as a standard and is delicious. Sometimes it costs as much as a Karlovačko beer, so choose wisely. If you ACTUALLY want ICED COFFEE, here’s what you ask for: espresso AND a cup of ice. They won’t charge you up the wazoo and you’ll be able to just pour your hot espresso over the ice and be refreshed in peace. 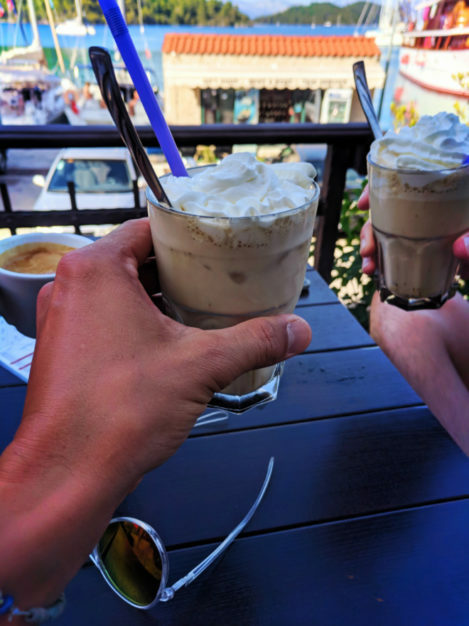 No matter what you end up with, you’ll be thankful for the coffee to go with the scenery and atmosphere, but consider yourself now well prepared to order coffee in Croatia like a pro. Mljet National Park is pretty large and covers much of the actual Island of Mljet. We made port in Polače with the main purpose of seeing the National Park. 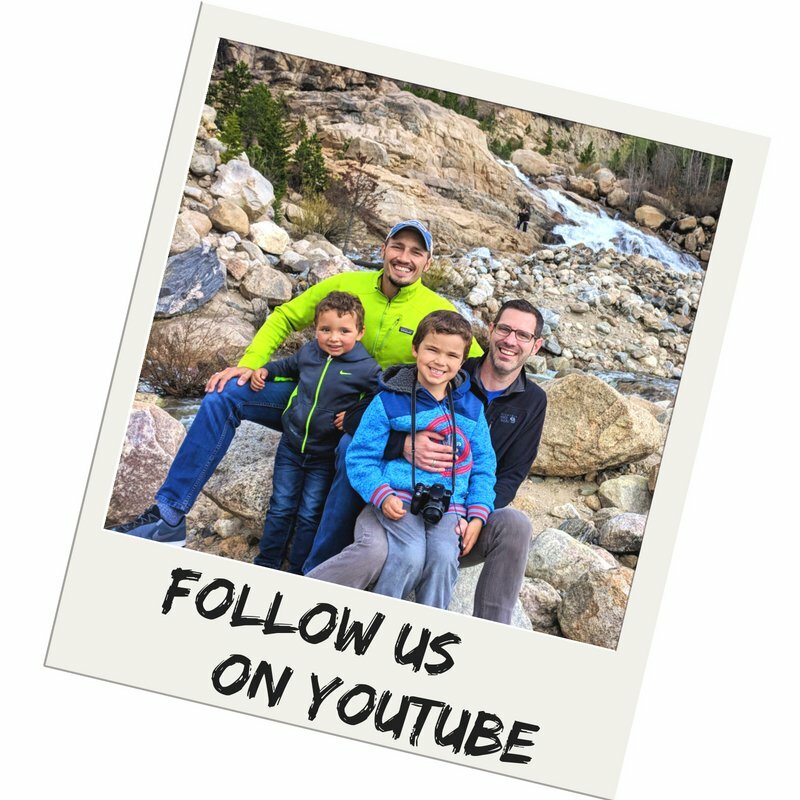 Being from the USA and visiting National Parks nearly every week, we had an idea in our minds of what to expect. Nope, we had no idea. Mljet National Park is very unique in that it’s mixed into some historic preservation areas as well as vineyards, the forest, a series of lagoons, and communities. It is gorgeous and fascinating to visit, but nothing like what you’ll find in the USA or Canada. 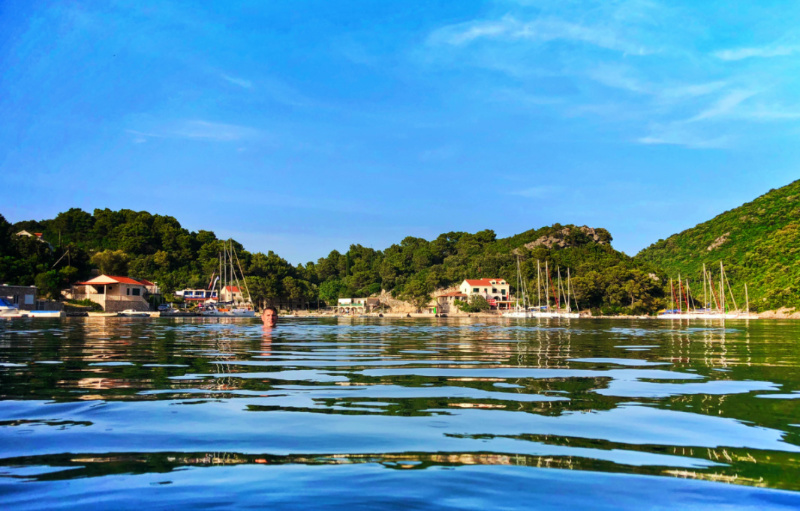 The main sites to visit within Mljet National Park are the “lakes” which are actually salt water lagoons, the Benedictine monastery, and the hiking trails. 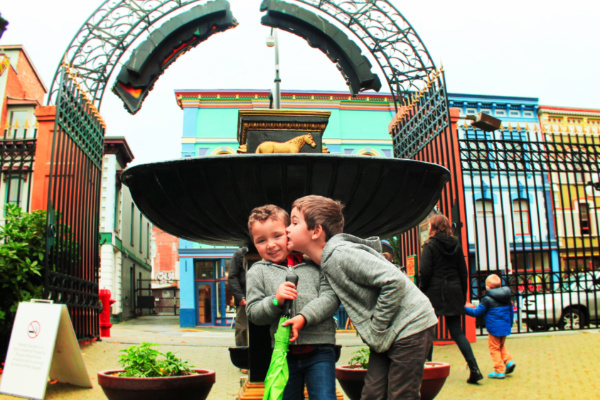 There are some beach spots as well, but they play second fiddle to the other sights. 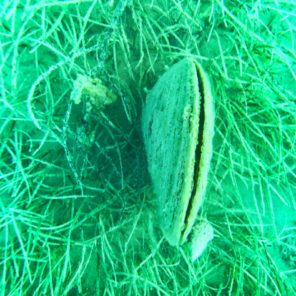 Swimming in the lakes is interesting as they are salt water and are filled with giant clams and sea cucumbers. Warmer than the waters around the island, swimming is ideal if you just HAVE TO get into the water and the weather isn’t awesome. 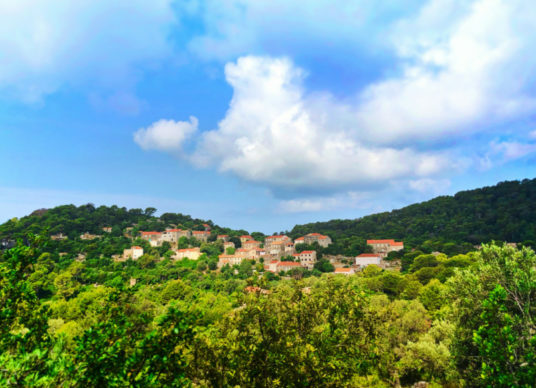 The hiking trails are another highlight in Mljet National Park. 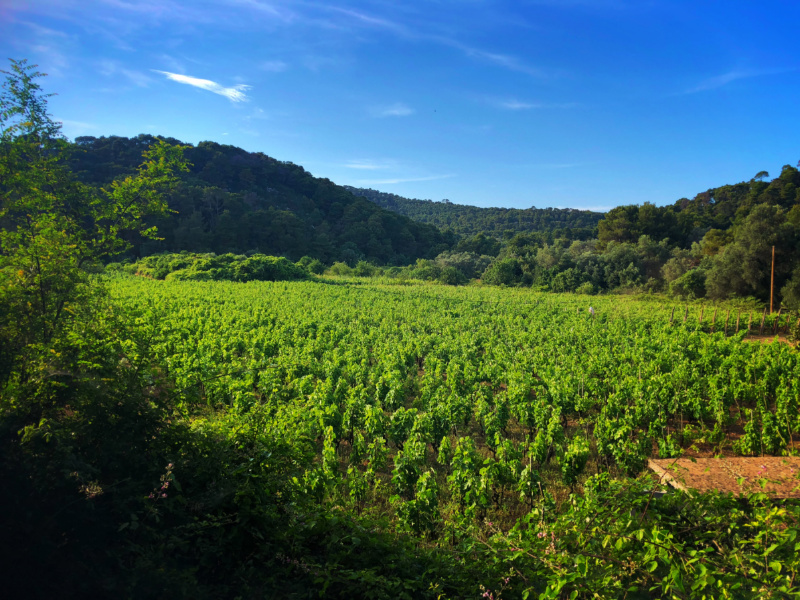 Due to the hilly landscape, vineyards on the island, the lagoons and the monastery, the views you get by hiking from Pomena to Govedjari are epic. Perfect. 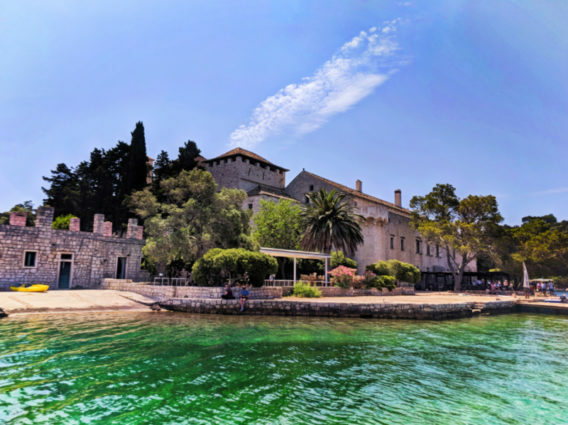 The best sight in Mljet National Park though is the old Benedictine monastery. Initially built in the 1300s, the monastery is located on a small island in the middle of the first salt lake, the Great Lake. 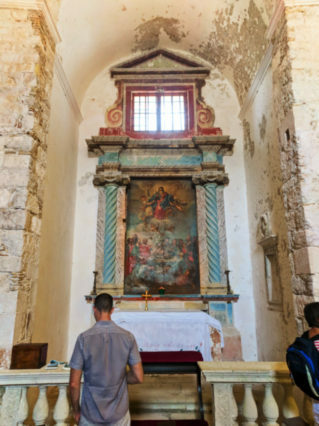 Over the centuries, the monastery changed hands many times, from the Church to pirates to being abandoned to going to the government and eventually back to the Church in cooperation with the Croatian government. Wandering around the island is really cool and a must-see. You can secure a spot on a tour of the monastery by stopping by the information window on the ground level of main building, but you can also wander the grounds on your own. 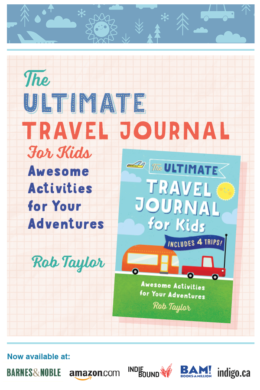 We recommend the latter so that you can take your time… or go as fast as you want to go. The main chapel, the colonnade and the trails are the three main sights to see. There are some pathways leading through some ruins and around the island itself, but nothing too grand. Tip: if you’re visiting Dubrovnik, there are several really cool monasteries to explore within the Old Town and on the Island of Lokrum. 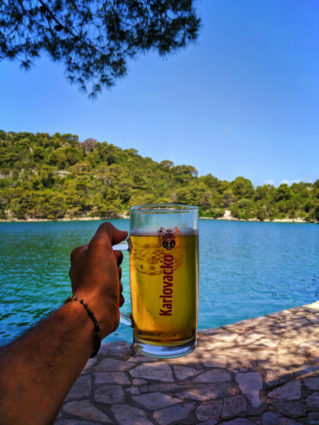 Mljet’s Benedictine monastery is also a great spot for an afternoon beverage. 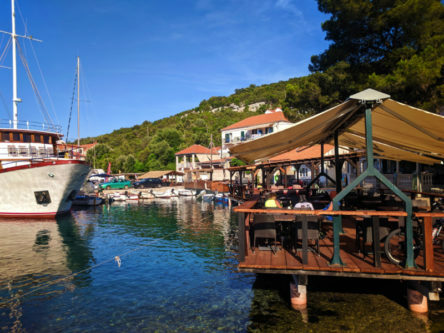 Whether you’re looking for coffee (see above for how to order) or a Karlovačko, you are welcome to sit in the shaded patio for as long as you like before taking the boat back to the main dock area of Mljet National Park. If you’re staying in Polače, you’re going to have quite the bike ride up the hill out of the town, but the workout up is evened out by the easy coast down the other side of the hill. 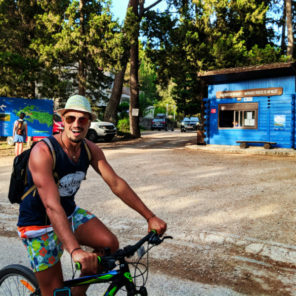 If you’re staying in Pomena (on the northwestern side of Mljet) you’ll also have a big up and down for riding into Mljet National Park, but it’s a bit closer so you need less time. Once you’re at the gate/entry to Mljet National Park you need to purchase you’re entry to the park. 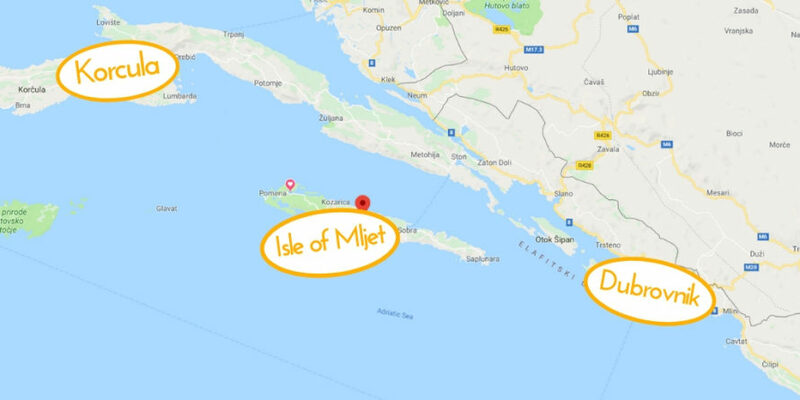 You can get single or multi-day entry passes to Mljet, so depending on your overall plans in the park save some money by getting the multi-day pass. This pass includes ferry passage out to the Benedictine Monastery. The map below shows a great biking route around Mljet National Park. Take note of the stars on the map, as those are points of interest or great photo spots. Tip: don’t forget your water bottle. 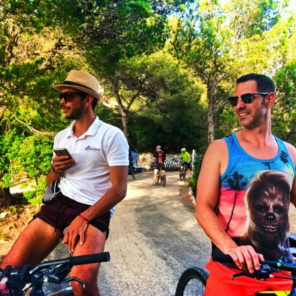 Even though you’re near the sea, it’s really hot during the day and you’ll be dying of thirst by the top of any hill you ride up. Since we were sailing around the Adriatic, we could stop nearly anywhere for a swim. 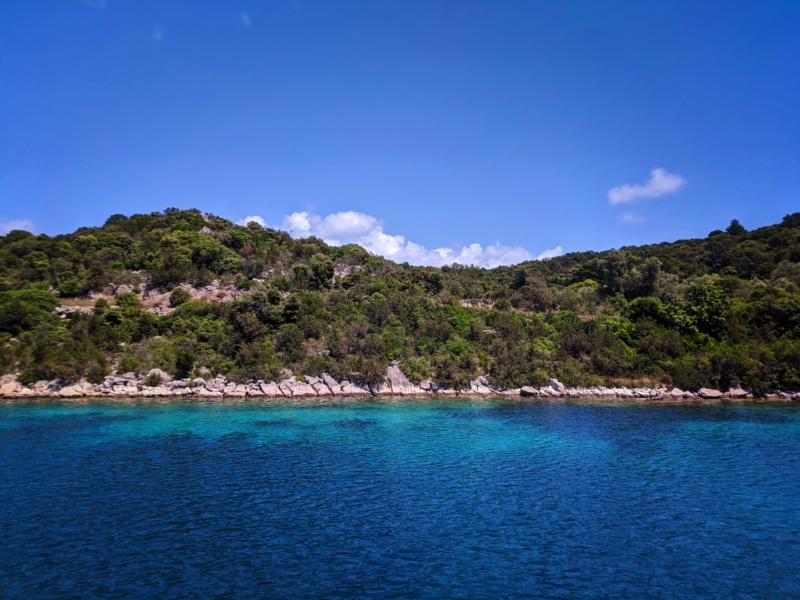 Changing ports from Polače to Okuklje, we got to stop into several beautiful, pristine coves, all a part of Mljet National Park. We spent a nice afternoon swimming and lounging about the bay around Otok Kobrava and there was nobody else around. 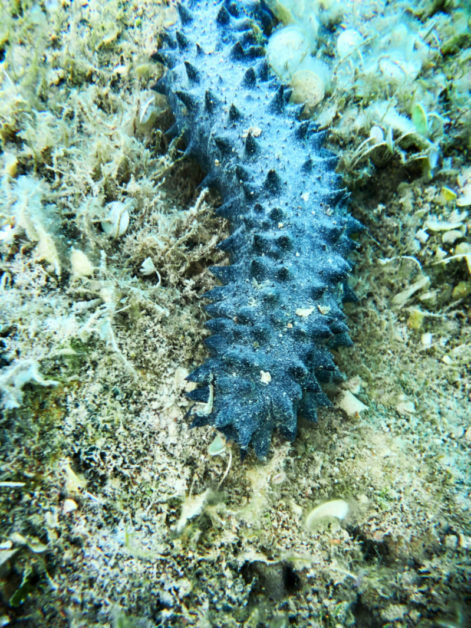 While there isn’t a ton of marine life in the Adriatic, or at least directly around the Dalmatian Isles, we did see a good number of sea cucumbers and blue fish of some sort. 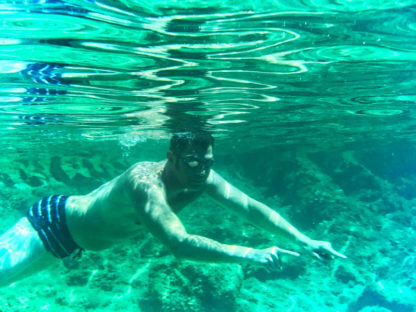 The main attraction of snorkeling and free-diving off Otok Kobrava was just to enjoy the water and be at peace with the sea. There was the opportunity to go ashore, but since the limestone rocks are so jagged in the part of Mljet nobody hiked around at all. Your choice though. The water is perfect though and that’s why you stop here. As I said, we pulled into Okuklje on a sailboat, and I’ll say that it was beautiful. We came around the bend and into the small bay to see just a small, sleepy town. There are a few different places to moor your boat for the day or overnight, so either radio ahead (if you have their call information) or inquire with one of the business owners before you drop anchor. If you’re driving from Sobra because you’ve gotten to Mljet via the ferry, you’ll head east along the main road and in about 15 minutes (10 Km) you’ll be there. Even though the Island of Mljet looks really big on a map, it’s a small world. 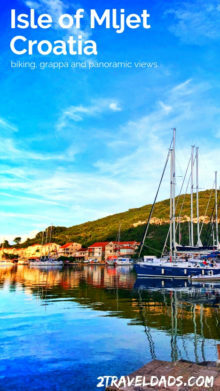 You may recall that we said that Vis was our favorite island, and it really was, but Okuklje was our favorite port of call on our Croatian sailing adventure. You can visit it either by boat or by driving if you’ve rented a car on the island (see above). I’ll tell you though, Okuklje is one of the tiniest towns I’ve ever been to, but I love it and here’s why. I think our goal for the new year is to do a different hike or bike route every day, both when we travel and when we’re at home. 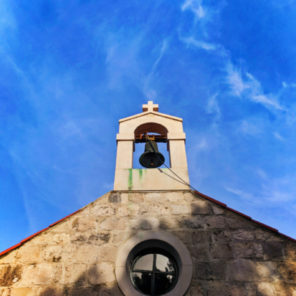 As we pulled into port in Okuklje on the Island of Mljet we immediately could see our hiking plan: climbing the hill to the Church of St Nicholas (Google Maps link here). This part of the Island of Mljet doesn’t have a ton of structures or prominent geologic features, so St Nicholas jumped out at us. From the small marina in Okuklje head east towards the swimming area and the main road. As you start to walk up the road out of the town, you’ll see small signs pointing you upwards towards the Church of St Nicolas. Continue to follow the road up the hill through the olive trees and ruined old stone houses until you are at the church. If you’re lucky, the church of St Nicholas will be open and you can take a moment inside, but chances of that are slim. 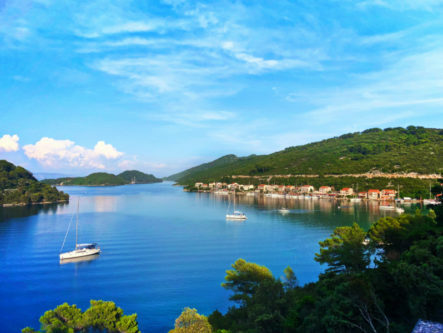 The real bonus of doing the hike up out of the town is the panoramic view of the Island of Mljet and the bay of Okuklje. It seriously looks like what I would picture heave to be. The water, the green hills, the shadows of the Croatian War for Independence, they all make the hike to the top and the view worthwhile. 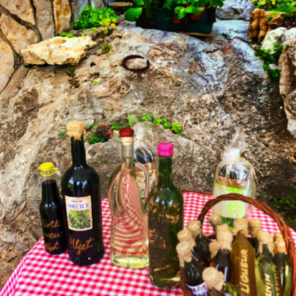 Tasting grappa and local wine was I think the funniest thing we did in all of Croatia. If you haven’t had grappa, um, you need to try it. So, it totally burns when you drink it and it’ll make you cough or gasp or sweat, and sometimes it’s all that AND has delicious flavor. We ran into a man at the edge of the marina who invited us into his home to try his wine and grappa. Chris and our friend Tom we’re quite prepared for the experience. I’ve never seen them laugh and choke like they did there. We also got to sample the olive oil grown and pressed in Okuklje. Seasoned with rosemary, garlic, and other herbs it was delicious and had a lot more flavor and depth than the olive oil we buy from the grocery store in the states. 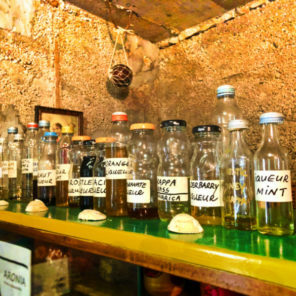 As we were standing in the grappa man’s house and were trying the olive oils, grappa, honey and more he struck up conversation with us, which was great. My favorite thing he said though was “The olive oil, you like? My woman she makes for me.” He was great, and so was everything we tried. The last thing you’ve got to try when you’re in Okuklje, or in Polače or anywhere else, is the peka. 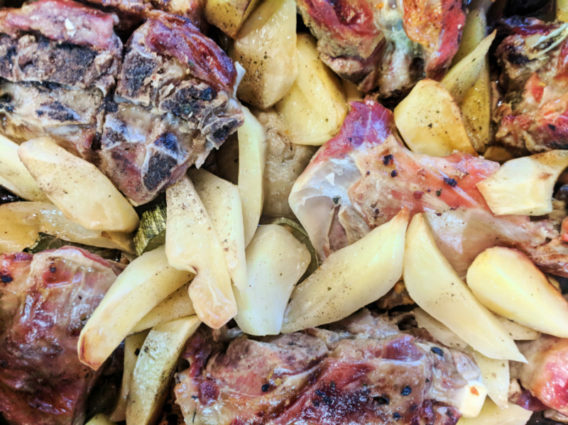 Peka is a meal that’s cooked “under the bell.” The bell is an iron tent that’s placed over a large pan filled with meat, onions, garlic, potatoes, seasonings and love. It’s so delicious. 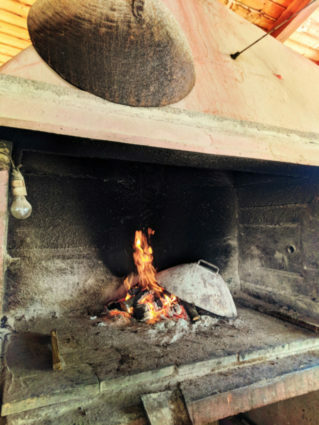 You can order your peka with a variety of meats, but in the Dalmatian Isles, due to their being surrounded by the sea, the primary options are either lamb or seafood. The seafood peka tends to be chalked full of octopus, squid, and large chunks of fish. If that’s you thing, ORDER IT!! Tip: if you’re with a group, coordinate your peka dinner in advance. It take hours to prep/cook and it’s a TON of food. You’ll need to share it. What’s a trip around the Mediterranean or more specifically, the Adriatic, without great swimming spots. Something strange about the nearly everywhere we’ve been on the Mediterranean is that there are very few normal beaches, meaning beaches like we have on the West Coast of the USA or Florida or something. France’s Med beaches are sandy, but mostly rocky. Italy is a combo or rock outcroppings (think Cinque Terre) and long shallow sandy shores (like in Venice). Croatia is rocky, craggy, stony and beautiful. One of the bonuses of the beaches and coves of Croatia is that there is very little sediment in the water, so it’s very clear which makes the water crystal-like and deceptively deep. The cove at Okuklje is just that. The urchins, giant clams, sea stars, sea cucumbers and huge barnacles were incredible to check out. 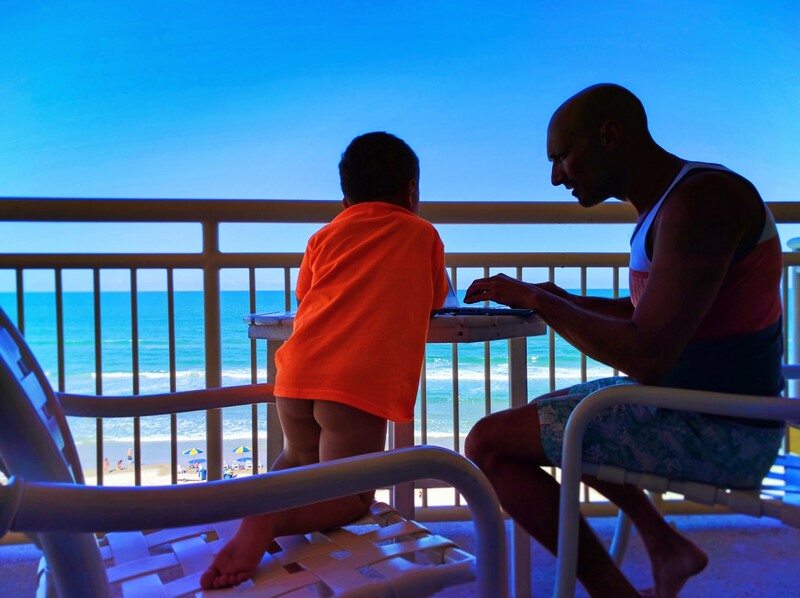 We were able to dive pretty deep to bring up shells and, as always, the water was perfect. Tip: you can swim all across the bay of Okuklje if you’re in good shape, but be wary of boats. It’s a small bay, but boats do sail through continually. 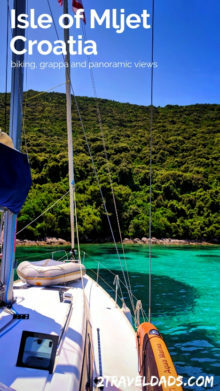 And now are you ready to plan a trip to the Island of Mljet? I’m ready to go back in a heartbeat. Please let us know if you have any questions or if you have explored more of the island. We would love to hear what else we need to check out next time. 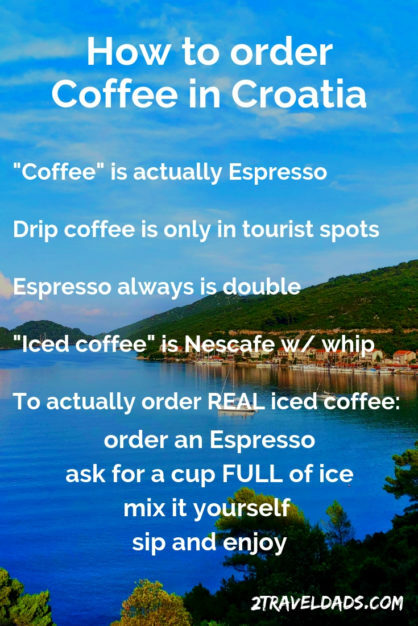 Feel free to pin this for you own travel planning for a trip to Croatia. 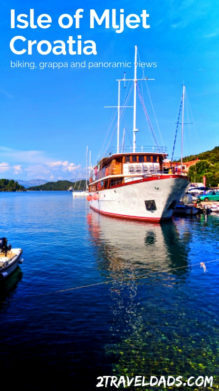 Sailing or taking the ferry, the Island of Mljet it awesome for a few days’ visit.